Home » life » Her dog warns her in the middle of the night. She goes to her son and is terrified. 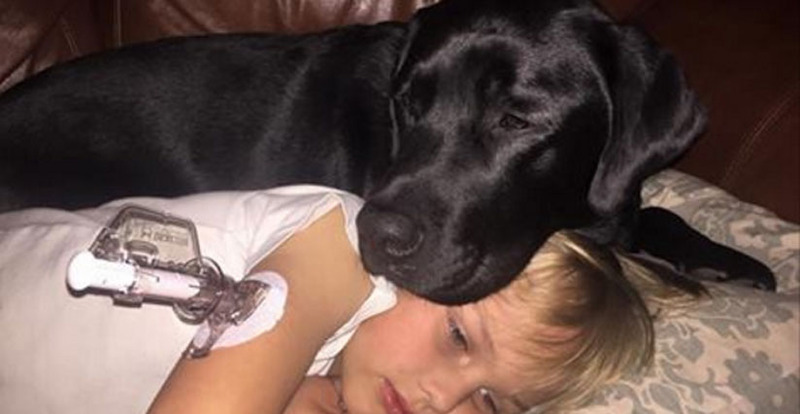 Jedi is a sweet, four-year-old Labrador from Glendale, California who has a unique ability: he saves the life of his owner, seven-year-old Luke Nutall, every day. How he does it is something quite remarkable. Jedi keeps watch over Luke as he sleeps. One night, Luke had been recovering from a stomach bug and was sharing his mother Dorrie's bed in case he needed help in the middle of the night. She had even set an alarm to check on him at a particular point. But well before the alarm was due to go off, Jedi suddenly sensed that Luke — deep asleep — was in trouble. Dorrie was also fast asleep, completely unaware that Luke needed urgent attention. Thankfully, Jedi sprang onto the bed and alerted her that Luke was in trouble. Luke suffers from type 1 diabetes. After taking a reading, it was apparent that his blood sugar was far too low. Although Luke has a blood sugar monitor, Jedi has been especially trained to smell even slight differences in insulin and blood sugar levels and can raise the alarm at the earliest sign of danger. Jedi's extensive training as an medical assistance dog began when he was just a puppy. He was placed with Luke at the tender age of 11 weeks and with the help and supervision of an organization called Canine Hope, he went through their "guided self raising puppy program." Whenever Jedi senses problems with Luke's blood sugar levels, he takes a colored baton to Dorrie. The baton is a signal that something isn't right. When Luke's blood sugar is too high, Jedi raises his paw. When it is too low, he lays down on the floor. Jedi has regularly saved Luke's life for three years now. When he correctly sounds the alarm, the Labrador is celebrated with a "puppy-party," receiving treats, hugs, and extra playtime. Luke and Jedi even have their own Facebook page where Dorrie writes about the daily challenges of life with a chronic disease. She aims to raise awareness of type 1 diabetes, which affects three million children and adults in the United States alone. Unfortunately, not all of them have an amazing partner like Jedi. These two really are a heart-warming team. Jedi's role is not only to alert others to Luke's highs and lows, but also to provide comfort to him when he has to endure being poked with needles, something he's used to, but still dreads. Luke and Jedi, may "the Force" be ever with you!